It’s that time of year again in many areas of the world: winter snows are starting to melt, spring is bringing rain storms, and waters that have been relatively lazy and tame are getting big and angry. Maybe you’ve been trapped by cabin fever; you haven’t been boating, and you’re anxious to get on the water. This article is a heads-up reminder that high water brings additional hazards to the boating scene. Take the time to look over this info, and use these cautions to evaluate the wisdom of setting out on that high-water trip. Riding the Flood covers many of the hazards, such as waterborne debris, strainers, foot entrapment, hypothermia, and flush drowning. The power of moving water is astonishing; underestimate it at your own peril. Bill McGinnis is one of the elders of the whitewater tribe. He founded Whitewater Voyages, now the largest rafting company in California, in 1975. That same year he published Whitewater Rafting, one of the earliest how-to books on outfitting for and running whitewater. His article, High-Water Safety Guidelines, covers the dangers from a rafting perspective, but has good info for every type of boater. Sometimes riding the flood isn’t a conscious choice, but rather the gift that Mother Nature gives. In June 2010, e-News editor Clyde and NRS Sale Manager Josh were on a Middle Fork Salmon trip with a group from Canoe & Kayak Magazine. We put on the river at a reasonable level, but three days of rain on the snowpack surged the river level to 8.6 feet, its highest point of the year, on the last 25 miles of the trip. 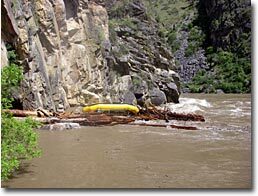 That hair-raising ending of huge waves and sharing the river with hundreds of trees is chronicled in Middle Fork Mayhem. A boater from another group died during this high-water event. 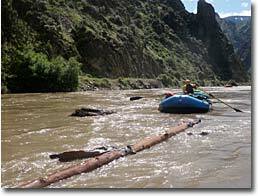 Middle Fork Carnage in Impassable Canyon tells the story of another private group during that same June flood event. David Schwantes describes in vivid detail their ordeal of lost boats after flips and the near death of one of their members. And finally, in That Time Mike Almost Drowned, Dave Hoffman presents an action video that captures a spectacular rescue of a swimmer in a swollen Salmon River tributary. The video really shows the power and velocity of high-water and the difficulty of surviving a swim in it. Running high-water can be exhilarating and exciting. It can also be deadly. Weigh the hazards and consequences carefully before setting out on the flood. Remember, going out is optional. Coming Back is Mandatory.